With its classically-inspired jasperware plaques and ormolu mounts, this mantel clock is a beautiful piece of late 18th Century Neoclassical design. 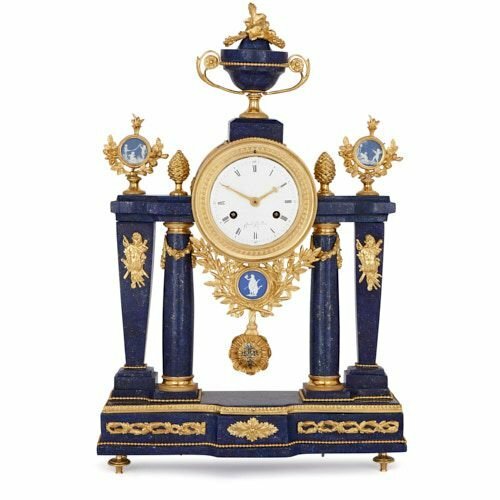 This fine mantel clock was crafted in France in the late 18th Century, with the lapis lazuli veneer being a later addition. 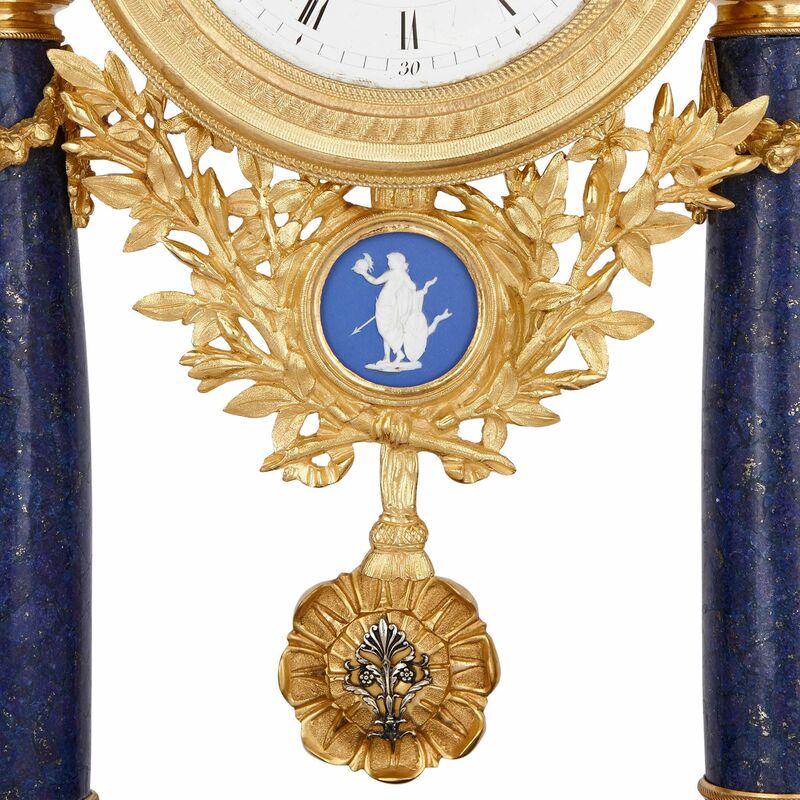 The clock stands on a shaped rectangular lapis lazuli base, which is supported on four ormolu toupie feet. This base is mounted with an ormolu central foliate motif, which is flanked by entwined, leafy ormolu vines, and framed below and above by ormolu beading and a foliate band respectively. 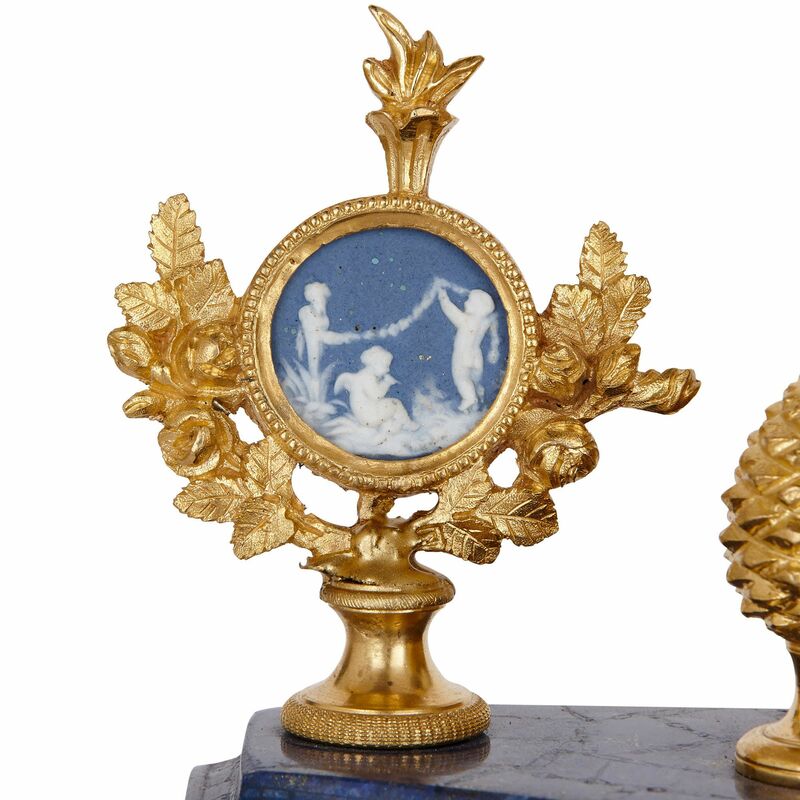 Four lapis lazuli supports stand on the base, their bases articulated by ormolu beading. These consist of two four-sided supports, with tapered lower shafts, mounted on stepped rectangular plinths, with two columnar supports between them. The two outer supports feature ormolu mounts, depicting sets of body armour and weapons. The columns between them have ormolu bases, smooth lapis shafts, and simple, Doric Order ormolu capitals, with flower garlands suspended from them. The columns support a simple, stepped lapis entablature, which is mounted, at its centre, with the circular clock case. 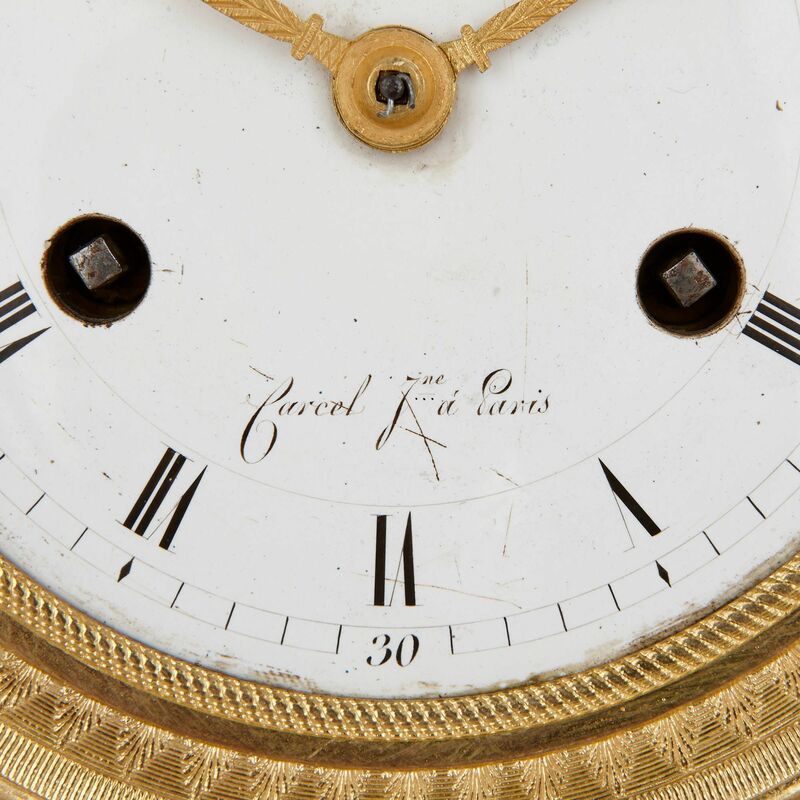 This features a central, white enamel dial, which is inscribed with Roman Numerals, and signed by the manufacturer, ‘Carcel Jne A Paris’. 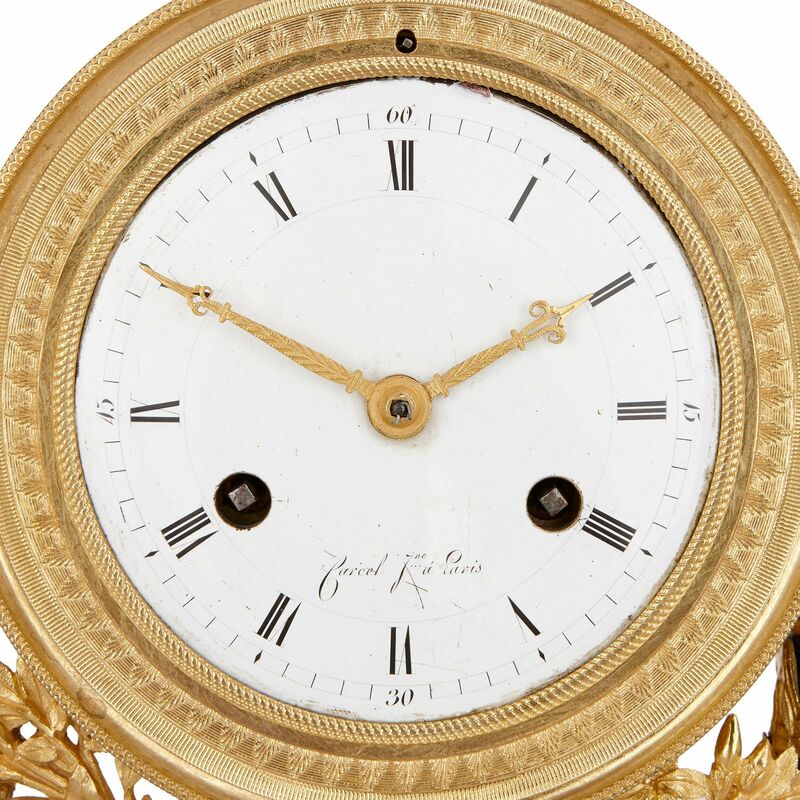 The dial is set within a finely-decorated cylindrical ormolu case, which is mounted, on its underside, with an ormolu motif, consisting of two tied, crossed laurel branches, with a circular jasperware medallion at its centre. This depicts the white, negative profile of Minerva (the Roman goddess of war), who holds a spear and helmet, and leans against a tree, with a shield propped up against it. This is set against a bright blue background. From the cylindrical ormolu case hangs the clock pendulum, which terminates in an ormolu flower, with a silvered bronze foliate mount. Two ormolu pinecone finials top the lapis lazuli entablature and flank the ormolu clock case. These are accompanied by two ormolu-framed jasperware medallions, which are positioned on the outermost parts of the entablature. These medallions depict cherubs, firing arrows and holding flower garlands. Depicted as white profiles, these cherub images are set against pale blue backgrounds. The circular panels are placed within floral ormolu frames, topped by flaming torches, and set on waisted stems and circular feet. 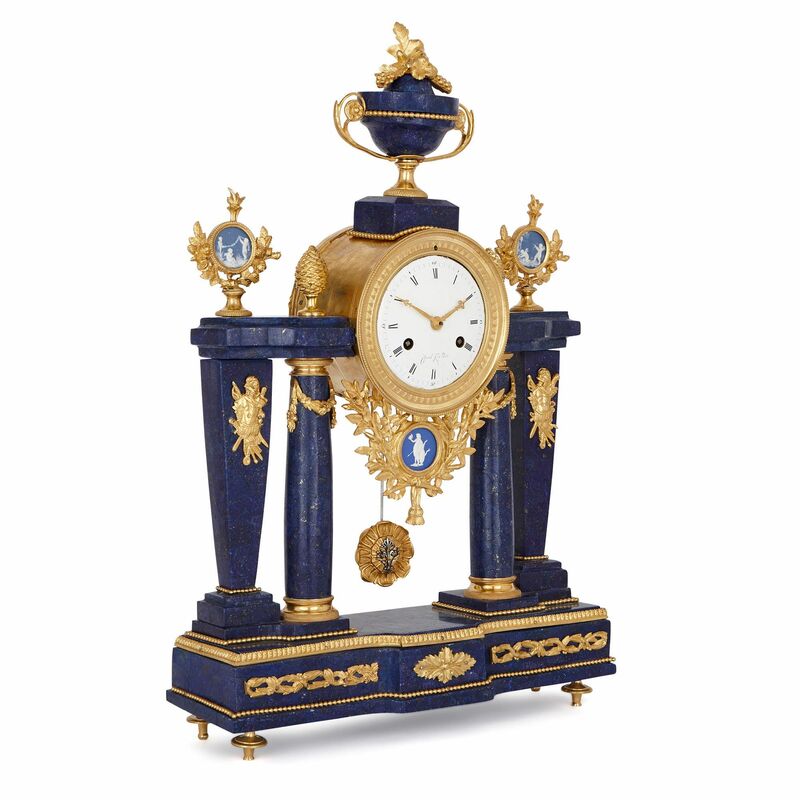 A classical covered urn, with a lapis lazuli body, tops the ormolu clock case. 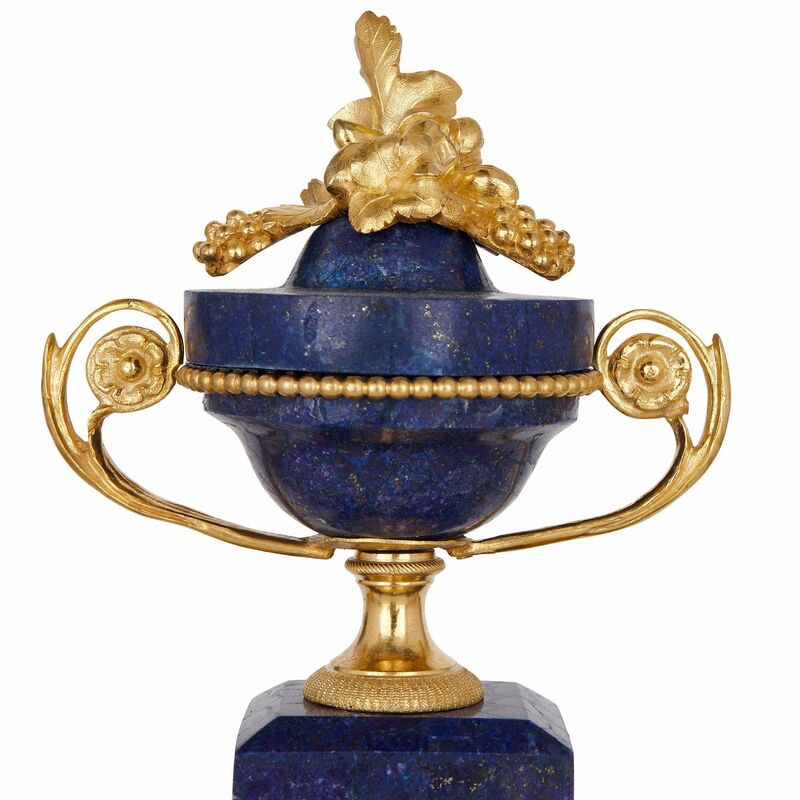 This lapis urn is set on an ormolu foot, fixed to a rectangular lapis lazuli plinth. The body above is edged, along its mouth, with ormolu beading, and fitted with two, scrolling vine-like ormolu handles. It is topped by a lapis lid, which is crowned by a foliate ormolu finial.